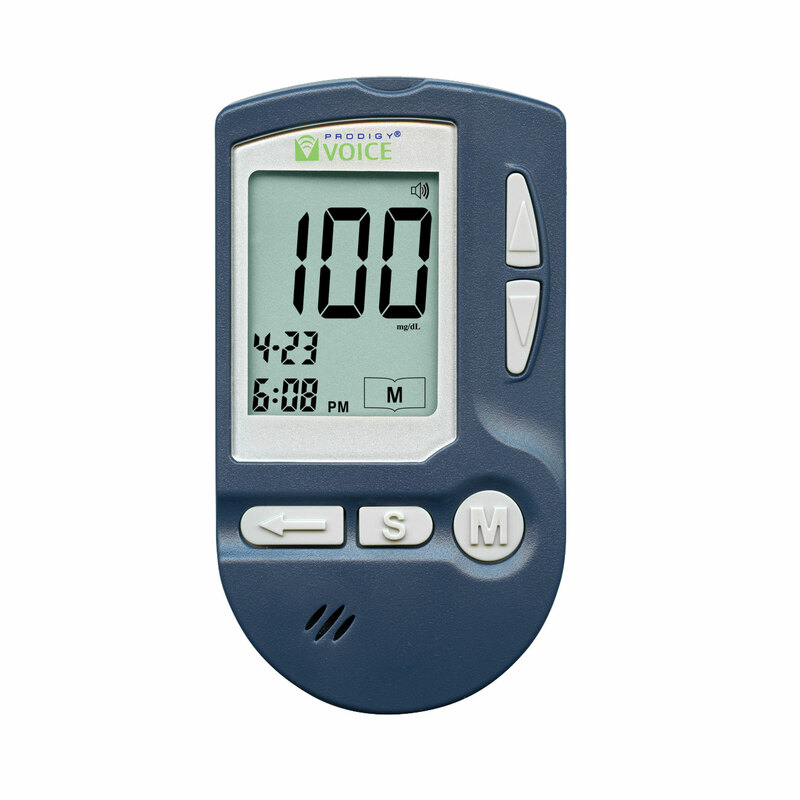 "Hear Testing Instructions and Results Spoken"
The PRODIGY VOICE Talking Blood Glucose Monitor Complete Starter Kit includes everything you need to start testing. Imcludes Glucose meter, control solution, 10 Prodigy strips, 10 sterile lancets, lancing device. Audible blood glucose monitoring system specially designed for the blind. The updated features were developed with the help of National Blind Associations and Certified Diabetes Educators. Audible prompts talk the user through all set-ups, step-by-step, including audible test results, meter status, averages, and memory records with date and time. Easy-to-identify buttons have raised tactile markings, including directional arrows and letters to allow the blind user to easily locate and operate them. 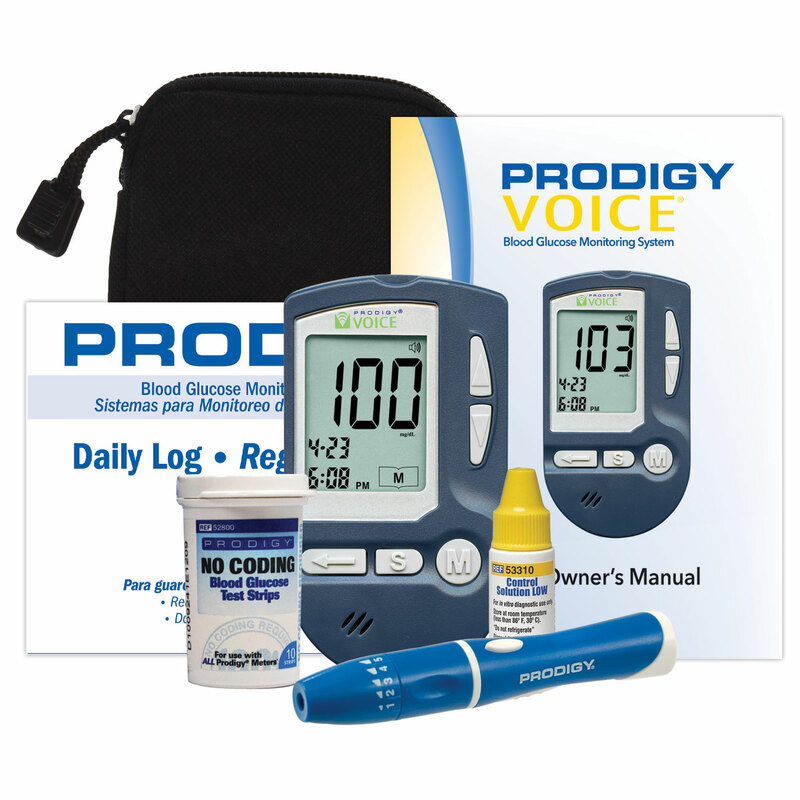 For greater comfort, Prodigy Voice offers you the option to test with blood from your palms, forearms, upper-arms, thighs and calves, which have fewer nerve endings than your fingertips. Smaller Blood Sample Required - requires only a 0.6 micro liter drop of blood - smaller than most meters available today. This allows you to use extra fine gauge lancets and significantly reduce your pain and discomfort. Audible Memory and Data Management stores up to 450 audible test results with date and time, and gives 7, 14, 21, 28, 60, and 90-day audible averages. Prodigy's software allows simple downloading of test results to your computer helping you and your Diabetes healthcare professional to track changes in your blood glucose level over time. REPEAT button allows the user to check and hear the last message or test result. No coding necessary - simply insert the test strip and the meter turns on automatically. You get safe accurate test results every time. Eject Button safely ejects the used test strip with a push upward. Built-in earphone jack for privacy (earphone not included.) Powered by 2 AAA batteries (included.) Size: 3.5 in. L x 2 in. W x 0.81 in. D. Weight: 1.86 lbs. 1-Yr. Limited Mfg. Warranty.